"There are times in life when words cannot account for our losses and we look comfort elsewhere. We may find, outside or deep within ourselves, sounds and images so powerful that they can help us transcend death and despair. How could one attempt to cope with the unspeakable pain of losing a child, through music? To find meaning in the wake of such tragedy, one would have to approach the composition with calrity and simplicity appealing to both the angelic and the inevitable. To avoid being pathetic, one has to find a balance between hope and frustration. The feeling of distress, though dominant, must not stifle the longing for salvation. To make a believable statement on loss and consolation, we must face both the desperate and the serene - zoid." Flim aka Enrico Wuttke was born in 1971 in Muhlhausen, Germany and has played the piano since the age of 7. He studied fine arts and made his recording debut in 1993 with the release of some private cassettes. In 2002 he recorded highly acclaimed albums ("Given You Nothing" and "Helio") for the Tomlab label. Mastering of 'Ohne Titel, 1916' was done by Greg Davis, cover design by Christos Lialios. It's the first release in a new Plinkity Plonk design - plastic wallets at last. Strictly limited to 500 copies. Ohne Titel, 1916 is a emotional collection of fragile melodic patterns, played out on basic piano and keyboard with some very slight electronic treatment, there's a real feeling of honest depth and great sorrow. Written after the death of his 8 year old daughter Fanny, it puts across the feeling of emotional numbness and learning to coping with the passing of a loved one. It's certainly not all morbid or sorrowful, the tracks often capture fondness and wonder of life it's self and of the need and effort to move on. I can't quite put my finger on how he's done it, but flim really seems to have weaved so much depth and power of emotion into each of these delicate sounds works. Leaving the listener captured like a rabbit in headlights, for most of the albums running time. It also feels like if you listen to hard, the tracks may full apart and turn to dust, or loose all it's petals like a once achingly beautiful flower. I guess you'd call it ambient/ modern classical, But genre labelling seems simply pointless and Irrelevant here.Don't think too much or analyse, what's going on here -just let it drift into you. 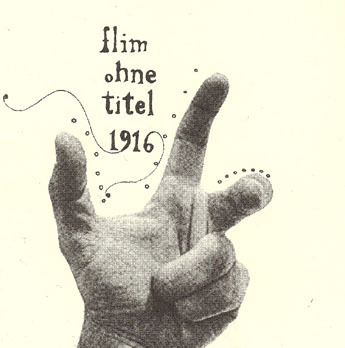 Some of the track titles of Ohne Titel, 1916 bear resemblance to those of F.S. Blumm's 2001 release Mondkuchen. I'd guess that this is not just a coincidence and it does indeed give some idea of what Flim is up to. But where F.S. Blumm is all candy flavored, Flim's music is full of deep sadness. The liner notes explain, that the music was composed as an attempt to cope with the loss of a child, trying to find a balance between hope and frustration. To create his music Flim makes use of piano, organ and thoughtful computer processing. Often just single notes are struck on the piano, they keep on resonating and then slowly fade before the next note is played. Rather than forming melodies these notes function as an irregular net of varying density. Other tracks are more drone-related, with the acoustic sounds stretched out into warm, hovering fields. After 'Holiday Diary' in 2003, this is Enrico Wuttke's, aka Flim, second release on Plinkity Plonk, a Korm Plastics parent label. It is made up of piano inspired music, an instrument played by Wuttke since his childhood. Here he intersects the improvisation attitude with minimal derives, meticulously diluted in savored inserts and retroactions. Idle and gloomy airs are in the balance with abandon, resignation and peace. It's a suffocated discretion, extremely deprived of his intimate essence as a very delicate and coy work, contemporary and classic at the same time. It's pressed in only 500 copies with an elegant cover design by Christos Lialios.